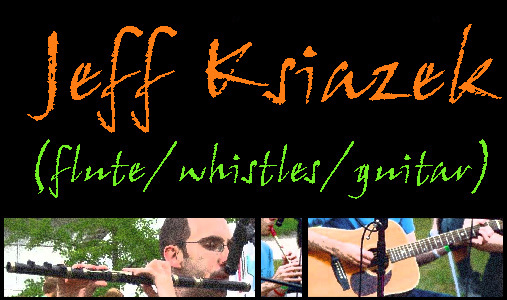 Although the newest convert to traditional Irish music in áthas, Jeff Ksiazek is no stranger to the greater world of music. He has been playing wind instruments for nearly two decades, focusing primarily on improvised music on saxophone. In 1998, Jeff received his bachelor’s degree in saxophone performance and English literature from Cornell College in Mount Vernon, Iowa. He studied saxophone with Bruce Western and jazz improvisation and arranging with Don Chamberlain, as well as performing in Cornell’s big band, jazz combo, and saxophone quartet. Upon graduation, Jeff played saxophone and flute in a variety of eastern Iowa bands, including the jazz/funk outfit Shafto Funkenstein’s Pimp Militia and Sounds of Seventies Supa~Symphony, the funk/jam-band quartet Dr. Z’s Experiment, and recorded with area studio bands Oblivious Minnow and Ponchos Pilot. Jeff’s fascination with Irish flute started when he heard Michael Tubridy’s flute break on the Chieftain’s version of “The Musical Priest/the Queen of May” and has been hooked ever since. Since fall of 2004, he has studied Irish flute and whistle with Asher Gray, DADGAD guitar with Randy Gosa, and Irish flute with East Galway master Mike Rafferty. His influences include Emer Mayock, Mike Rafferty, Kevin Henry, Sylvain Barou, Michael Tubridy, Matt Molloy, Kevin Crawford, and Harry Bradley.